Food Technology is the development of food products to be manufactured and sold to the consumer. It is taught through a design and make process as part of the Design and Technology National Curriculum. • Helping pupils understand the relationship between nutrition, diet and our health throughout life. • Choosing, storing and cooking a wide range of foods to produce interesting meals which conform to dietary advice and which are suitable for a wide range of individuals. • Techniques and skills in food storage, preparation and cooking. • Awareness of food hygiene and food safety issues. Throughout the course there will be an emphasis on practical work. This will give pupils an opportunity to develop a wide range of culinary skills and use food processing equipment in a safe and constructive fashion. The controlled assessment tasks must be completed under supervision within the classroom. Pupils must bring a clean apron, suitable cooking/baking dish and a container to transport finished products back home – to every practical lesson. Advance notice will always be given of such lessons. 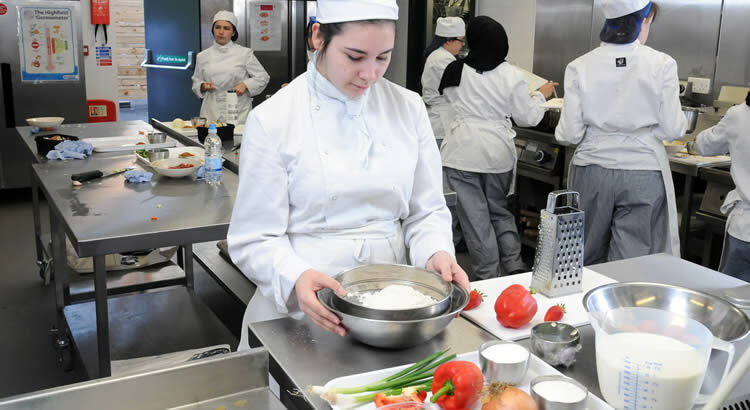 For more detailed information about the Food Technology curriculum please click here.